Biltmore, the Vanderbilt’s fine mansion stands grand and tall in the mountains of North Carolina. Its halls are filled with fine furniture and art, its dining rooms with delicacies, but deep in the depths of the basement Biltmore has a secret. Serafina, the girl that no one knows about—no one, that is, except her father. Serafina’s father maintains the machines of the estate, including the new electrical system. Unbeknownst to the Vanderbilts, Serafina’s father doesn’t have a home to go to each night; instead, he and Serafina live secretly in the boiler room of the estate. Serafina longs for friends and a more public life. She wanders the halls of the mansion at night and keeps the estate clear of rats. One night while she’s roaming the halls Serafina finds more than rats, she finds terror as she watches a man in a black cloak chase and absorb a young guest of the Vanderbilts. As more children disappear, Serafina must find a way to stop the black cloak. 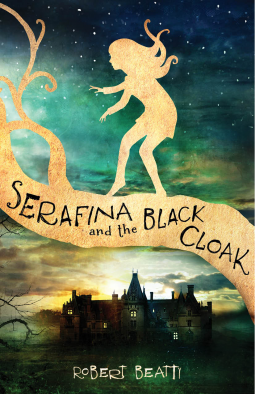 Deliciously creepy, filled with mystery and magic, Serafina and the Black Cloak will keep you reading. It’s a shivery good story that includes both magic and a historical glimpse of life in the Golden Age. Beatty built suspense throughout the story. It kept me reading and interested, though I found that in one mystery in the story the teases were frequent and the clues frustratingly thin. Overall a great read, suspenseful, creepy, and yet full of hope. I read Serafina and the Black Cloak as an electronic ARC courtesy of Disney Hyperion and NetGalley.